Increase worker productivity through Workplace as a Service (WaaS) with a secure, high-performance experience on any device, anywhere, at any time. Many IT organizations struggle to securely and easily deliver performance-driven remote desktops to their mobile workforce. 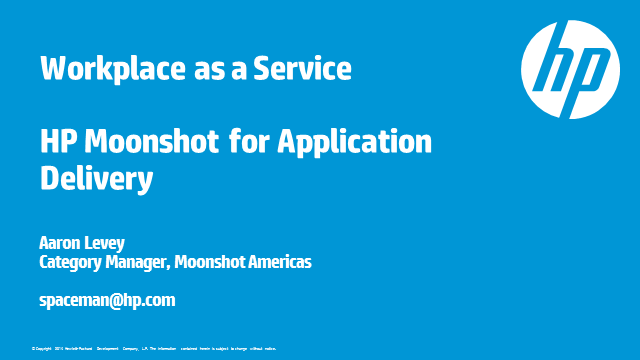 HP Moonshot, along with partner Citrix, delivers a compelling solution for the new ways people consume applications. In this session, learn how HP Moonshot accelerates business innovation with WaaS and improves productivity with a comprehensive mobility program that supports bring-your-own-device (BYOD) and delivers mobile access to a wide range of enterprise applications—even if the server infrastructure isn't designed to handle this type of environment. This solution provides an ideal balance of compute, graphics, memory, and interconnect capabilities to enable the extension of a wider array of applications to a broader set of users. Today’s enterprise IT manager is on a journey to the cloud and hybrid IT. Where are you in this journey? What’s the right path for you and your business? All paths to the cloud start with automation—automating tasks, IT processes and service delivery. In this session, Alex Ryals from global technology distributor Avnet details the steps to automation and what aspects of private and public clouds contribute the right mix of services for enterprise hybrid IT. Alex will also provide an overview of HP’s hybrid cloud portfolio, including HP Helion and why it’s leading the industry for OpenStack cloud solutions. Shift your IT efforts toward innovation. Converged solutions allow you to simplify the IT process by purchasing and managing whole systems—not components—allowing your staff to innovate, while still serving current business needs. The days of adding more space, more servers and more power to your data center are gone. Learn more about the trends driving the need for converged systems and the benefits of these optimized solutions over the traditional do-it-yourself model. According to Frost & Sullivan, "Aligned to your business needs and solution strategy, HP’s converged systems can be fully integrated into your broader cloud, big data or virtualization solutions, backed by HP’s decades of expertise in engineering solutions for applications like VMware, Microsoft and SAP." After watching this video, download the 9-page whitepaper for more information about optimizing your IT infrastructure for today's evolving environment. The new style of IT is built on a new style of IT professionals, join us to learn how it will impact your very own IT organization. Listen to this Converged Infrastructure video to understand how HP can help CIOs close that skills gap and help IT professionals to become masters and IT convergence architects of the future. In comes converged systems, your fast track to the future of IT. Watch this interview to see how your New generation data center infrastructure will take shape. What is HP converged infrastructure and why now? Today, a siloed infrastructure doesn't work for you or your business. It's time to bring servers, storage and networking together - working as one, managed as one. That's HP Converged Infrastructure. Find out why you should look to HP for simplified IT through quick deployment, intuitive management, and system-level support. HP VP Tom Norton shares his insight and unique prospective on HP's new converged systems, solutions and services. Everywhere you turn these days, someone is talking about converged infrastructure as it relates to big data, cloud and virtualization - and with good reason. The cloud represents a paradigm shift in computing—one that enables highly scalable applications and services to be delivered on demand. For virtualization and mobility, it’s no longer a question of bring your own device—it’s about the relationship and potential you have with multiple devices and how they make your life and work easier, faster and better. But, if you’re like most IT professionals and technologists, realizing the potential of the cloud and mobility requires answers to questions that may not have occurred to you yet.